Since 2012 MrsMacca and I have been living in the honeymoon period of hillwalking/mountaineering & climbing since our 1st Munro (Nevis) for charity. We quickly started to enjoy a bit of scrambling, our first Scottish winter, travelling to Europe and doing El Tiede (we got to 3600m... before winds stopped us) and then spent 2013 getting more vertical, bit of easy outdoor and indoor wall climbing, trying some camping and finally in Feb 2014 going a few days of proper Scottish winter climbing in on Ledge Route, Dorsal Arete and then finally an epic 11 hour day on Curved Ridge in ropey winter conditions - loved it! After speaking to some great guides who sadly weren't qualified for the Alps we were recommended a cracking guy called James Thacker (www.jamesthacker-mountaineering.co.uk ). 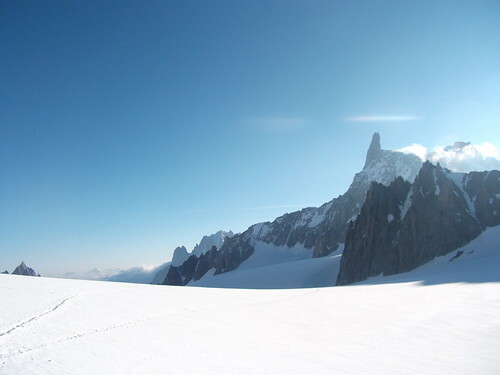 The plan was set for a week starting June 22nd, based out of Chamonix, to try different routes and develop a mix of skills. Our goal? 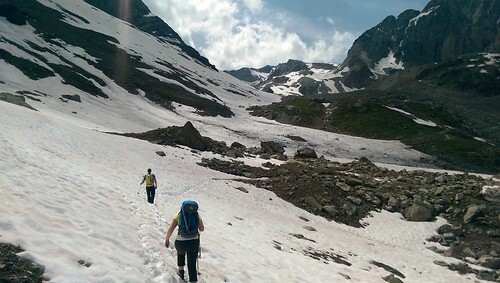 Get to the Alps, understand what the environment was about, how altitude affected us and learn more about how to move on big mountain terrain.. ultimately - push our comfort zone and skills! Here's how it went! 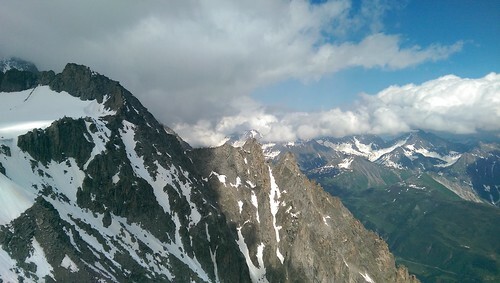 Quick couple of flights got us to Chamonix via Geneva by mid afternoon with enough time to jump the cable car (50 euros) up to the Aguilles du Midi at 3842m - to start the acclimatisation process. 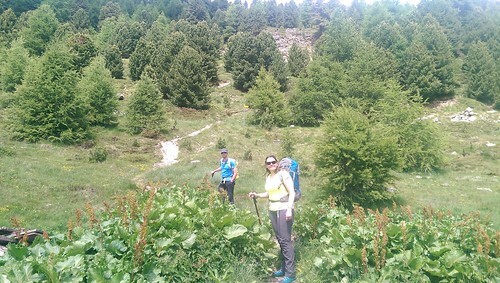 You arrive at altitude and pretty quickly recognise that you're not quite 100%.. bit fuzzy headed, hint of a headache then when you start to climb steps you can get a bit unbalanced.. all part of the fun! Locked in cloud sadly as you can see from the photo's we checked out the museum and terraces as well as the ice tunnel and the new glass "box" that you can stand in suspended high over the valley - after an hour or so headed back down to go meet James for dinner and to discuss plans. 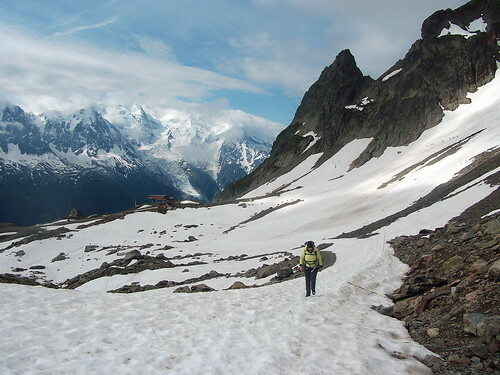 Chamonix has so much to offer for food, drink, shopping (the great shops could bankrupt you!) and we settled on a cracking steak/burger joint called Moo next to the hotel and plans were made! 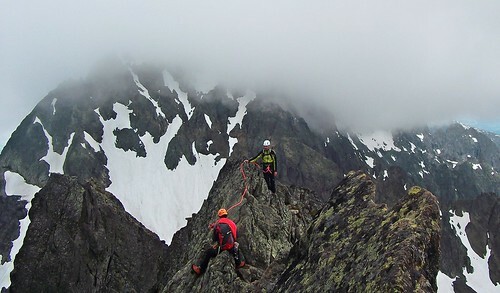 Forecast of thunder storms on the massif meant we decided our "shakedown" day would be rock climbing to get a sense of what we could do and to gain more confidence on longer, multi pitch routes. 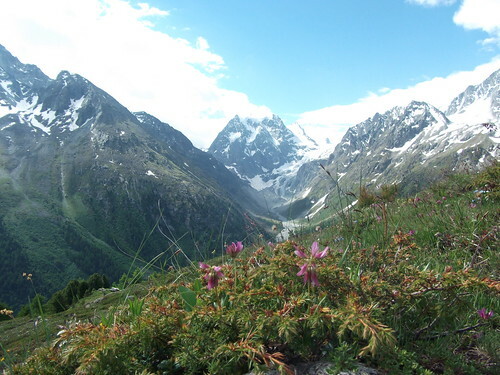 About 5 mins from Chamonix centre is the crags known as the Giulland (meanibg Guide). Amazing face of granite, 4 pitch climbing from grade 4 upwards and right next to the road.. with cafe! I could get used to this!. We roped up and spent the morning doing some bolted climb practice to about grade 5 then a 4 pitch route before a coffee and heading to our next route further up the valley to a rock face and route known as the Cocoa Girls on the Agulles Rouges - a high face route at about 5c. We only did 2 pitches due to thunder starting but it was the hardest, most exposed and most amazing climbing we have done! .Small holds on slabby faces but the holds we positive and foot placements were good as long as you were in control... few battle scars due to a poorly controlled abseil and a sharp overhang lol. Guillands Climbing - Like Rosyth Crags but with sun and a cafe .. oh and view of Mont Blanc! Sam on our first warm up pitch. Sam Topping out on Cocoa Girls (pitch 2).. slabby 5c climbing at its Alpine best! Yeah you gotta watch that sharp overhand on the abseil - still smiling though! Proper mountains day! 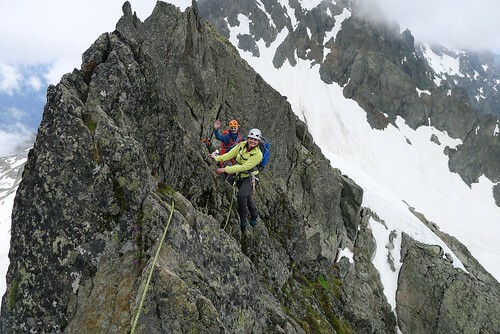 We headed out of Chamonix to the Aguille Rouges and headed up the Flegere and Index cable car to make a hit on a cracking "beginner" ridge traverse at about 2700m , keeping the acclimatisation going and getting some boots on rock! 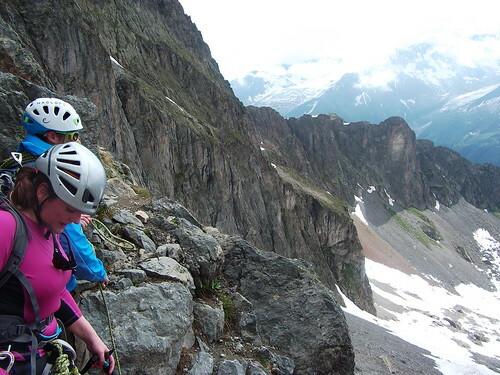 You hike up the galcier trail for about 50 mins then its onto rock and an airy, jaggy and awesome rocky ridge traverse with astounding views and a few cracking points of exposure - a perfect training traverse ahead of bigger, higher or more technical routes! 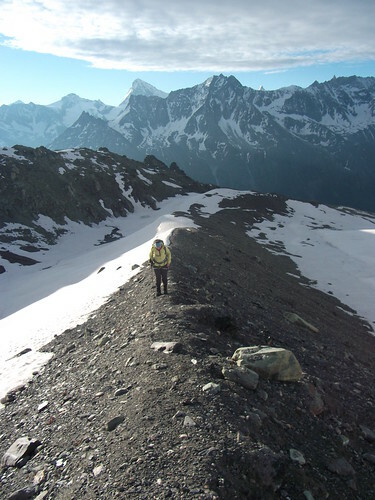 Sam walking the trail to get to the route.. Hows that for a view back to Mt Blanc! About mid way after a very exposed overhanging downclimb.. got very airy! Sam and I on final stretches - big smiles as ever! 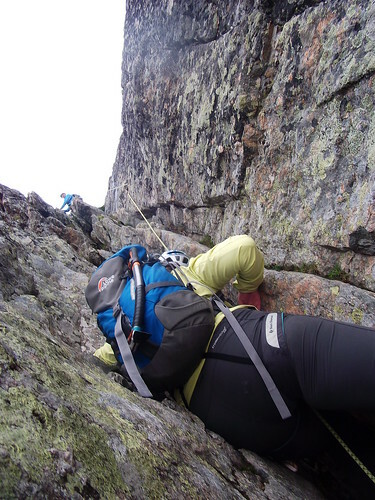 The descent is fairly easy scrambling then walk out .. including some great fun steep glisading .. you want to have your axe ready as the run outs can be steep and well.. deadly! 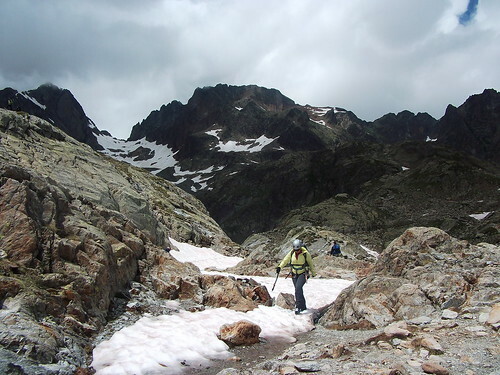 The Aguilles Rouges gets its name from a red bloom of Algae that forms on the snow all over .. very War of the Worlds! Sam walking out below the snow line. From here its about a 2 hour easy down trek to the cable car for a much welcome drink and cake if you fancy at the wee cafe. Day a success! Day 3 - Torino Hut and some real altitude. Our plan now was to get up to a hut high on the massif and use that as a base for some other routes, the choice was Rifugio Torino on the Italian side so we shot through the Mont Blanc Tunnel and grabbed one the best coffee's I have ever had at the we cafe at the base car park along side Italian Mountain soldiers heading up for training. This also gave us the chance to experience the luxury that is the Italian mountain toilet.. hows your squats folks? We headed up to what is referred to as a hut but which is actually an incredible large facility that has dorms, chill out cafe, large dining halls, bot/kit rooms etc. 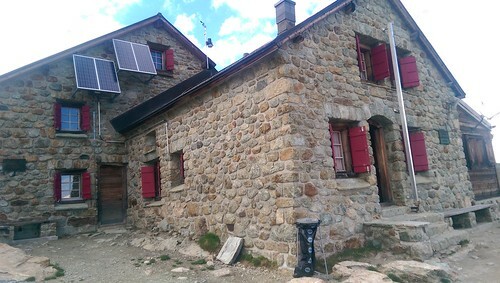 and even WiFi - sleeps about 100 and is a perfect base for Mountain fun! Cost for the night incluidng dinner and breakfast is around 40 Euros (BMC/McOfs and Guides get a discount) and its great value. Bring your sleeping bag liner and a VERY light hut kit - we stuck to wet wipes, toothbrush, a change of tshirt and try to bring a book or something to keep you occupied if you are hanging about). 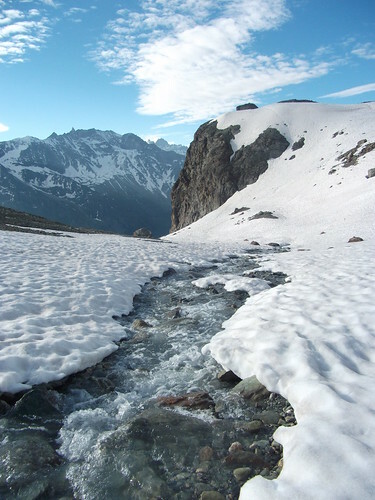 There is fully running water etc but to use it would mean bringing more gear (towel etc .. FAST and LIGHT is the alpine goal but you can leave your Hut kit in the kit room so you don't need to carry it on the mountain. 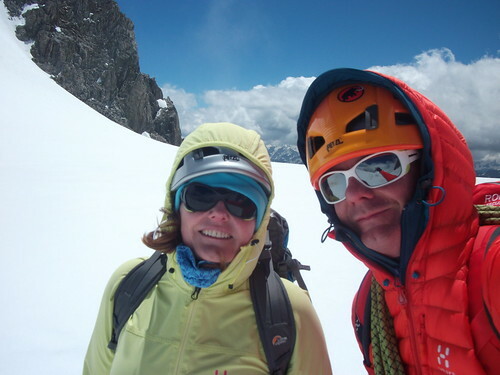 From here we headed out to practice Glacier movement , progress our acclimatisation (now at 3375m) , climbing in crampons and generally just to enjoy some time on the mountain before the next day which was to be a bigger outing. This is where you really feel the effects of altitude. 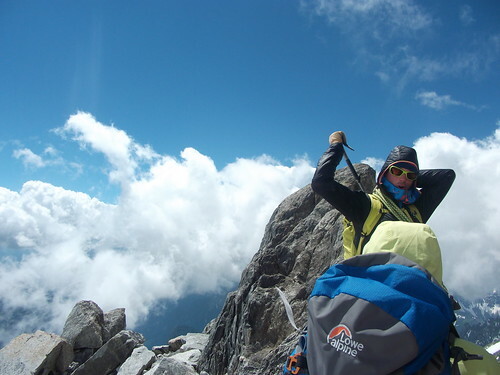 Walking flat, roped for crevasse security, is ok and down is fine but as soon as you start to ascend it hits you. Breathing hard you learn just to nibble at the terrain, one foot in front of the other. While yes its really tough going it has a hypnotic effect and I have to say I kind of loved it for its Mountaineering reality! Easy to pretend your on the final summit of Everest lol!.. 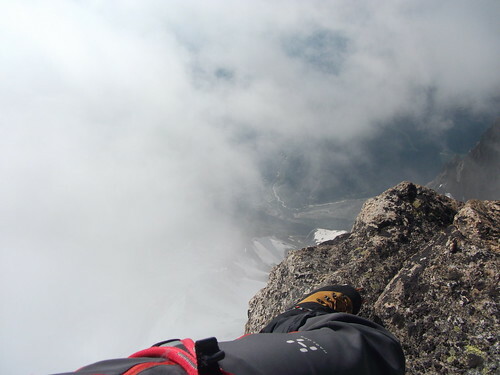 saying that getting to the top of any route is heaven and you can finally get your breath back! 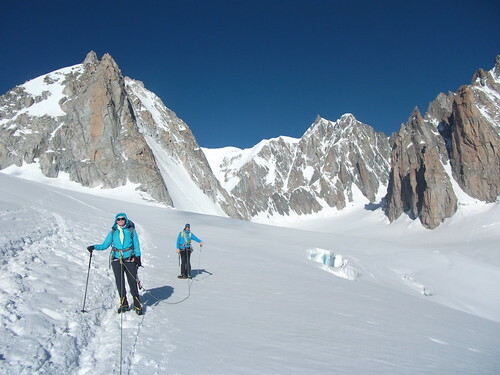 After some time walking across the crevasse laced glacier we started up the d'Entreves ridge in Crampons, a fairly easy scramble, few tricky moves and plenty of natural protection for the rope we have amazing views and a superb ascent. The area is also renowned for amazing crystal formations and as we moved i spotted 1 or 2 but on closer inspection James found an entire mini cave of them so after some ice axe excavation we liberated some gems for family, my dads grave cairn (growing big) and for James little boy. 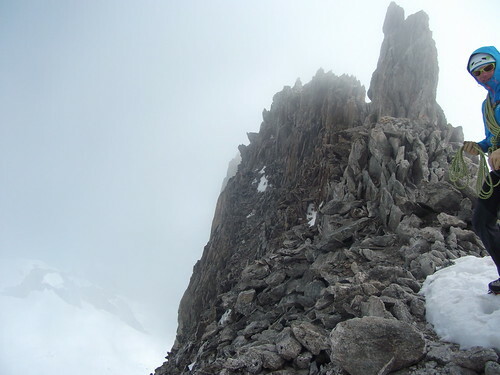 We reached the mini summit and crampons off grabbed a bite, a drink , some pics and prepared to head down carefully down-climbing and moving on the fractured but grippy rock. Once back on the glacier we started the haul back to the refuge with the clouds parting to offer simply breathtaking views - there is a lifetime of routes here .. I wish I had started 20 years ago! 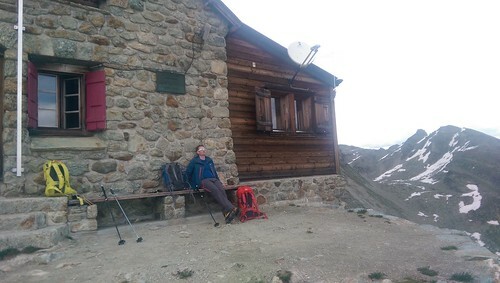 After rock and ridges we decided to take in a more traditional mountain day, a smaller traditional hut and a big old walking day - James tagged it "Big Scottish/Small Alpine". Off to Switzerland we headed (keep your passport on you al all time in the alps just in case you ascend in France but descend in Switzerland or Italy..). 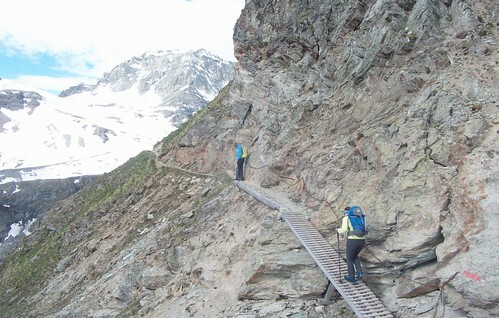 We arrived at Arolla and started up the trail to head to the Aguilles Rouges Hut. Setting off in the valley heat in B3 boots.. toasty. Now heres where a story kicks in..
we got about an hour in (maybe 200m) of slow uphill moving (altitude remmeber) and sam suddenly raslies she has left her cash for the hut in the car.. no probs I'll go! .. #fail. I figured if I hustle fast down I can take my time coming back up.. so off it trot (in B3 boots remember).. soon I'm sweating like a pig (via the BIG cows with horns) and arrive back at the car, grab the cash, turn and set off back up the rout. Boom... hit a wall.. breathing like a 99 year old I progress slowly. I make it back after 40 minutes or so but i burst! The rope in my pack is now getting VERY heavy.. for the next 3 hours I'm the last in line and walking slow but I made it.. tip.. take your time! Oh and B3 boots may be comfy in snow and ice but they ain't no Nike's! Few Snow patches a we move up. Beds are mats on platforms but as we were the only people there (first of the season) we had choice and space! Blankets and bag liners for warmth , head torches and gear ready we hit the hay early after a great swiss mountain meal provided but the guardian (he reminded me of Obelix from Asterix the Gaul). 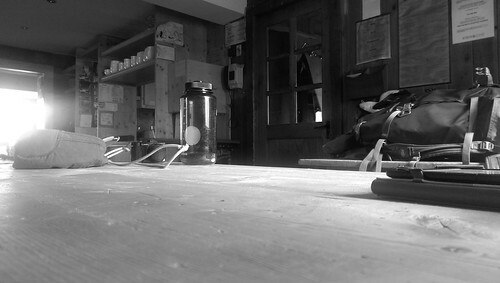 5am Start - a typical mountain hut brekkie of cereal, bread, cheese and a bowl of coffee then of we set with a nice "Marching Tea" prepared by the guardian in our Nalgene's. This is a hot fruity tea and much relished on the mountain! 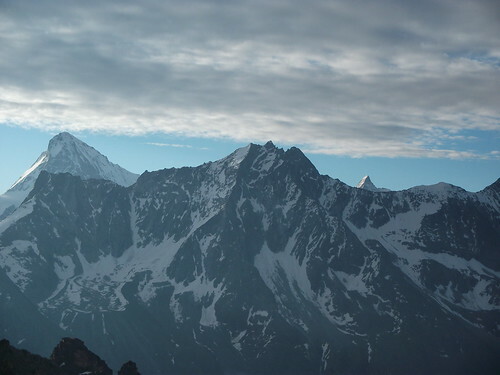 Anyone recognise the mountain peaking out in the sun on the right? Back at the car pretty soon after, a short hop back to Chamonix then it was chance to chill in the sun, grab a well earned beer or two and just reflect on an amazing week. 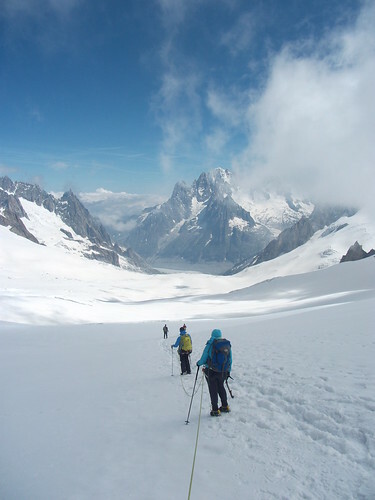 We loved the whole time, Chamonix is beautiful and is just an Alpine hub of people - skiers, climbers, runner, BASE jumpers - something for everyone. 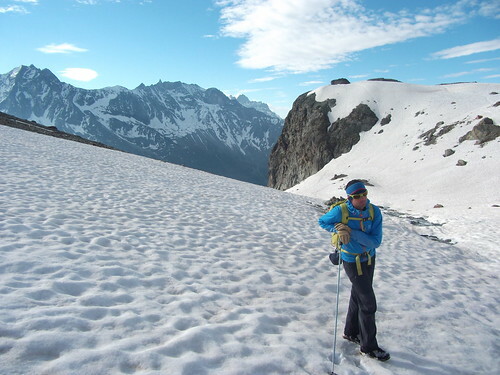 The surrounding mountains offer every type of mountaineering experience you could ask for and we have only scratched the very surface (if even that) and the fondue is , well, cheesy! We will be back, hopefully soon and hopefully often. 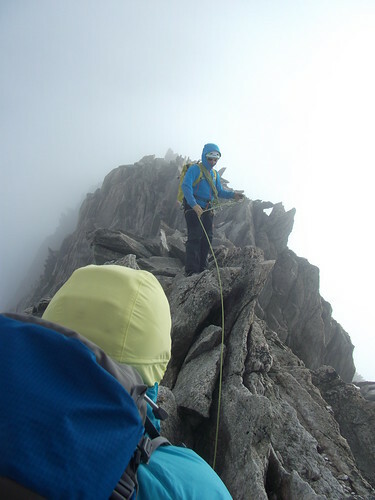 Ben Nevis Ledge Route! First Winter Climb + rescue!